Our web design company has captured the market of website design outsourcing in India. Flash web design, ecommerce web design and web based applications are part of the list of web design services that we offer. Our web designing staff consists of highly competent and skilled website designers that have expertise in outsourcing website design that can fetch the required business online. We provide professional and affordable web design services using latest tools. Our web designs are well suited for small and medium business. We make custom web site design keeping search engines in mind and designs are SEO compatible. For us there are three major aspects that rule the designing of a Web Site. Our designers can make choices that not only have solid usability or aesthetic values, but sound business or technological advantages too. The company team is balanced in Web Design and development. Before our designer start working on a web design task, following is clearly worked out. Know the primary goals of the Web site before beginning the design process. Set performance goals that includes the overall information retrieval success rate (i.e. site navigation) and the time to find specific information, or preference goals that address satisfaction and acceptance by users. 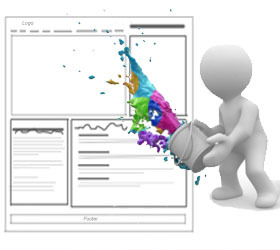 Do not rely exclusively on the initial design ideas of one person or group for a Web site. Use an iterative, or repeated, design approach to create the most useful and usable Web site by developing and testing prototypes.